"People are fighting to reach the day when no one has to say Me Too"
Oprah Winfrey, the first African-American woman to receive the Golden Globes' annual Cecil B DeMille award, won't run for the White House in 2020. Sorry, everyone. Minutes after Oprah delivered her powerful speech at the Globes, the hashtag #OprahForPresident started trending on Twitter. "If that speech doesn't make you want to change the world, nothing will. #oprahforpresident," wrote one Twitter user. Several celebrities and writers also agree, one of whom said: "Wow. Oprah. Powerful, inspiring, eloquent. I'm in tears. Please run for president? You really do have all the best words." Sorry, though. 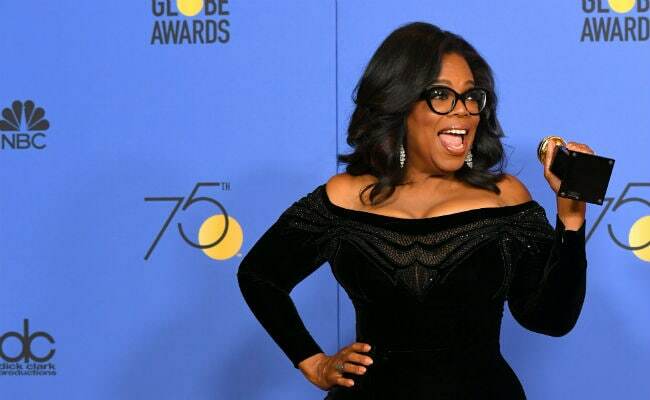 Bloomberg reports that the 63-year-old activist and actress' response backstage after being asked if she planned to give 'Oprah 2020' a shot was "I don't, I don't." In her speech, Oprah Winfrey who was introduced by Reese Witherspoon, referenced both the #MeToo and Time's Up campaigns. Needless to say, she wore black in protest of sexual harassment, as did most others attending the Golden Globes. #1 "For too long, women have not been heard or believed if they dare speak the truth to the power of those men. But their time is up! Their time is up!" #2 "I want all the girls watching here now to know that a new day is on the horizon"
#3 "The new day... will be because of a lot of magnificent women and some pretty phenomenal men, fighting hard to make sure that they become the leaders who take us to the time when nobody ever has to say 'me too' again"
Wow. Oprah. Powerful, inspiring, eloquent. I'm in tears. Please run for president? You really do have all the best words.